Check out Bayou Boogaloo this weekend for a free music experience. BTW, it features a huge rubber duck race. Yeah! Catch 30 local legends, including Rebirth Brass Band and Hot 8 Brass Band, doing what they do best, on multiple outdoor stages. Set along Bayou St. John, this weekend of New Orleans soul will dance you into summer mode. Founded during the evacuation of Hurricane Katrina, the Mid City Bayou Boogaloo has shown its commitment to New Orleans through rain or shine, and the 2013 festival is no different. The event will occur Friday (5pm-9 pm), Saturday (10 am – 9:15 pm), and Sunday (10 am – 8:30 pm) rain or shine. Please show your passion for the Bayou Boogaloo and all the great things New Orleans has to offer. On Saturday, May 18, the Bayou Boogaloo Bicycle Pub Crawl will take place from 8 AM to 1:15. What better way to start your day before spending the afternoon at the festival? Click here for more details. On the morning of Sunday May 19th, Bike Easy is having a bicycle second line. The 11-mile ride starts at Bayou St. John at 11:00 AM, and concludes with an after party at the Bayou Boogaloo. Come out to have some fun and get some exercise before having fun at the festival. For more information check out the Bike Easy site HERE. 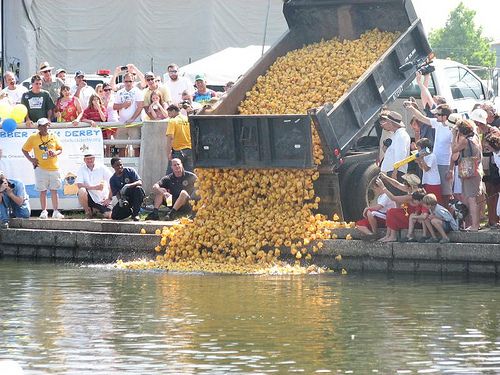 On Sunday, May 19, Second Harvest Food Bank will host the 4rd Annual Rubber Duck Derby at the Bayou Boogaloo. Adopt one (or more) of Second Harvest’s 15,000 rubber ducks and then come to the Bayou Boogaloo to see if your “lucky duck” swims to victory and a fantastic prize! Click here for more details! The 5th Annual Zulu Run to Ride 5K will once again take place on Saturday, May 18th. Please click here for more information. To sign up, please complete the application! Have a great run and good luck! !